There’s a rule in California that may seem bizarre in a drought-stricken state: in the winter, reservoirs aren’t allowed to fill up completely. In fact, even as this post goes up, a handful of reservoirs are releasing water to maintain empty space. The practice, which has long inflamed combatants in California's water wars, is due to a decades-old rule designed to protect public safety. If a major winter storm comes in, reservoirs need space to catch the runoff and prevent floods. But with advances in weather forecasting, some say this preemptive strategy is outdated. A new, “smart” flood control system could save water in years when Californians need it most. At one of the state’s major reservoirs -- Folsom Lake, east of Sacramento -- the volume of water spilling from the dam has swollen eight-fold in the past few weeks, sending billions of gallons downstream, much of it into San Francisco Bay. Early in February the reservoir reached a key threshold: 60 percent full, which is the highest water level allowed during the winter months, according to rules from the U.S. Army Corps of Engineers and the Sacramento Area Flood Control Agency. Last year, most of the reservoir was a dry, dusty lakebed. “What reservoir was left was confined to the old river channels before we built the dam,” says Drew Lessard of the U.S. Bureau of Reclamation, the federal agency that manages the reservoir. Just an average-size winter storm can send huge volumes of water down the American River into Folsom Reservoir, boosting the lake by 10 percent or more. A major storm can produce dramatically more than that. Sitting 40 percent empty allows the reservoir to act as a buffer against floods, gulping the runoff without overflowing. In years where the upstream reservoirs are fuller, Folsom Reservoir is required to remain 60 percent empty. Releasing water downstream does produce benefits, supporting wildlife and endangered fish. It also prevents salt water from San Francisco Bay from backing up into the Sacramento-San Joaquin Delta, which is a drinking water supply for many in the Bay Area. But preemptively releasing water has its own risks, especially if it doesn’t rain again, as happened in 1997. The reservoir was lowered and, “it was dry the rest of the year and we never really rebounded,” recalls Lessard. As California enters a fifth year of drought, seeing operators deliberately dumping water can be disconcerting. A few weeks ago, Shauna Lorance of the San Juan Water District near Sacramento went to state regulators with a message: when water is disappearing downriver, it’s hard for water consumers to take the conservation message seriously. Ralph is piloting a more dynamic method of flood management at Lake Mendocino with the Sonoma County Water Agency. Instead of a maintaining firm limits on reservoir levels dictated by the calendar, managers would use cutting-edge weather forecasts to gauge how much flood space they need. Instead of emptying out a reservoir preemptively, managers would allow the reservoir to stay fuller, keeping an eye on the weather forecast. If a big storm appears, “they’d have three, four, five days lead time, enough to release that extra water and get it out of the way safely,” said Ralph. If storms don’t appear, the water would be saved for later in the year. Ralph says “forecast-informed” operations are becoming possible thanks to major advances in weather research. New weather satellites and more precise forecast models are making predictions more accurate. Researchers are even flying planes into atmospheric rivers to gather information about how they behave. Ralph says even with the improvements, there’s more fine tuning to be done. But he says potential is clear in a drought-prone state like California. “Imagine we have the option to keep, say, ten percent extra water behind each dam in the winter,” he muses. At Folsom Reservoir alone, that amount would supply 200,000 households for a year. 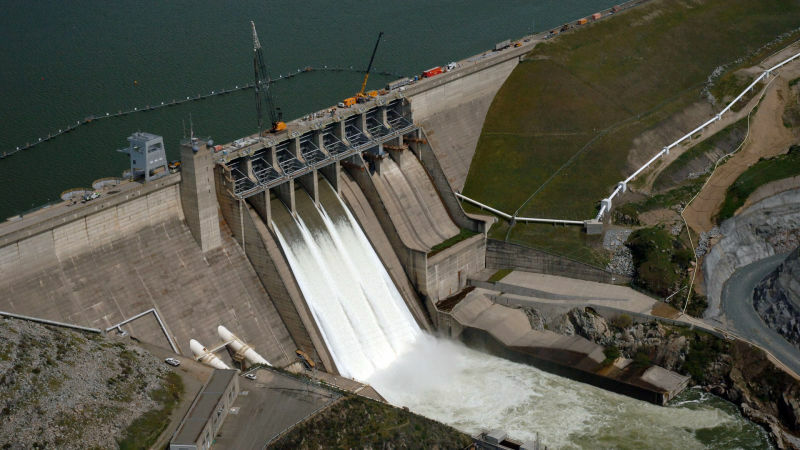 The Corps is considering using the new weather-based operations at Folsom as part of a major update to the reservoir operations plan. The question is whether weather forecasts are precise enough -- not just as to when a storm is coming, but how big it is. “When it comes to forecasting the size of events that we’re most concerned about, they are about 20 percent off,” says Kukas. Getting it wrong is not an option. If the dam overflows, it could flood Sacramento and hundreds of thousands of people downstream, and potentially put the dam itself at risk of failing. “The consequences, you don’t even want to imagine them." Working with reservoir operators around the state, the Corps says it currently takes weather forecasts into consideration in making water release decisions, though in a minimal way. The Corps plans to decide whether to manage Folsom Reservoir using weather forecasts next year. Changing current flood rules for how much the reservoir can hold in the winter would require an act of Congress. 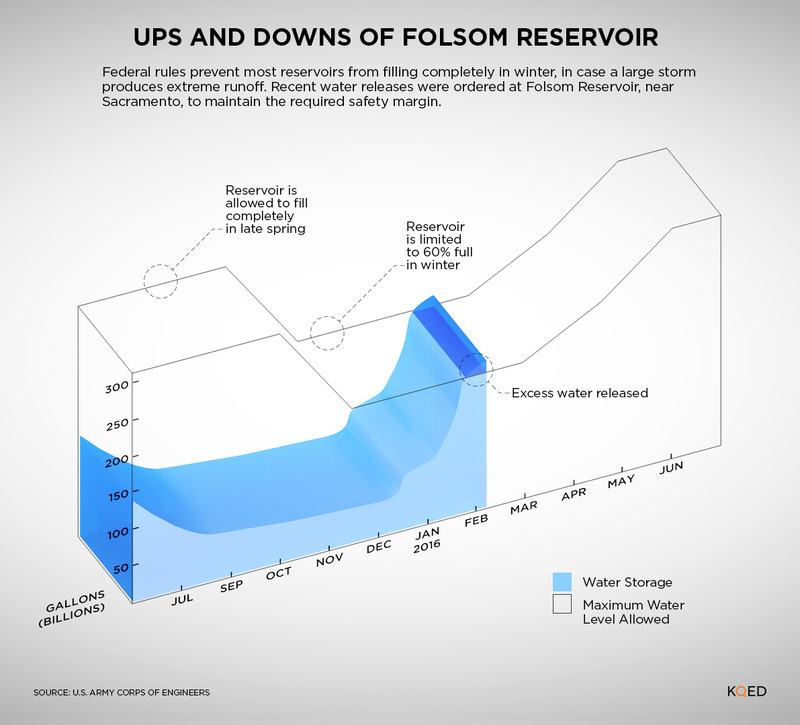 But if it works at Folsom, Jones agrees that it would be a model for reservoirs across the Western U.S.
“This could have a huge impact on the West."